The free Cat Age Calculator can convert the age of your cat into human years. You can also find out your age in cat years with the Cat Age Calculator. The Cat Age Calculator is a quick and simple way to calculate the age of your cat in human years as well as your own age in cat years! How does the Cat Age Calculator work? You simply need to enter the age of your cat (cat years) into the Cat Age Calculator. Once you press the calculate button, you´ll see your cat´s age in human years straight away! More of a dog person? If you´d like to find out the age of your dog in human years, our selection of Animal Calculators includes a Dog Age Calculator. 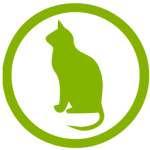 You can calculate the age of your cat, in human years, as well as your age in cat years with the Cat Age Calculator. Cats develop particularly quickly in the first few years of their life and then more slowly once they reach maturity. The first year of a cat´s life is equivalent to 15 human years whilst the second year is only equivalent to 10 human years. When a cat has fully grown into an adult, each cat year is equivalent to 4 human years.